Made by Aristoc Industries Pty Ltd in Melbourne, Victoria, Australia, 1969. Dining setting of one table and four chairs, the table with a circular top of wood covered in white plastic laminate supported on a metal pedestal column resting on a circular, white powder-coated metal base; the chairs of similar form with an angled, rotation-moulded white plastic seat and back in one unit and each with a circular drop-in cushion of foam rubber with original red wool upholstery, the seats moulded in one unit with the supporting tapering pedestal column resting on a white powder-coated circular metal base connected to the seat through the centre of the column. Table with Aristoc label affixed to underside; chairs with 'Aristoc' stamped into metal plate on base of seat beneath cushions. 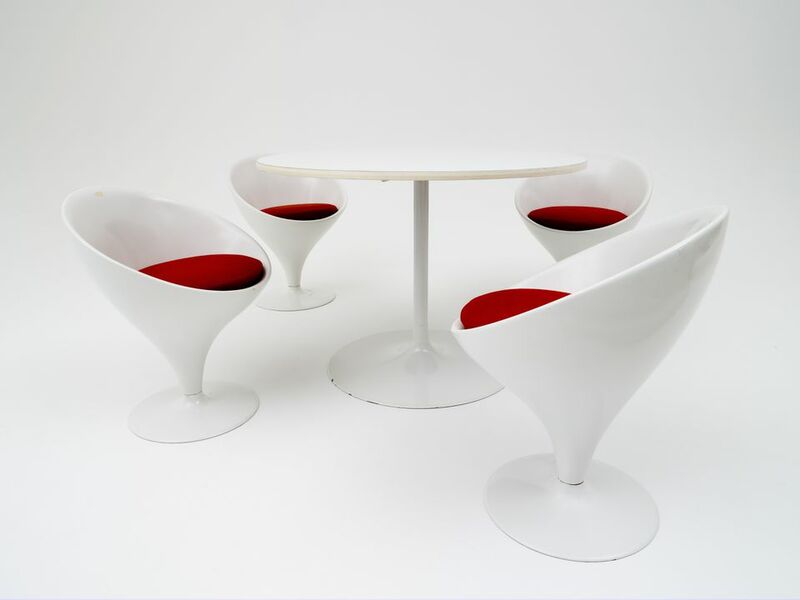 Designed by Grant and Mary Featherston, Melbourne, 1968-69; made by Aristoc Industries, Melbourne, 1969. It should also be noted that T Lane identifies the makers of the 'Stem' chairs as 'Furniture Makers of Australia (formerly Aristoc Industries Pty Ltd) with the assistance of ACI Plastics' (Featherston Chairs, p 57). However, the museum's pieces bear Aristoc labels and stamps. The 'Stem' chair was listed on the Australian Design Index and received a Good Design label from the Industrial Design Council of Australia in 1970.